While I don't know if it's a "new form of living" as the site claims, the Sheer Kitchen "and Emotion" does promise to change the way you cook. If you're very large, probably not for the better—this bubble stuffs an entire kitchen into a space only 148 cm in diameter. 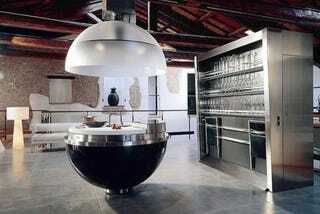 The bottom half contains a double sink, the cooking area—with four infared burners, one of which you can cook on a hot stone with—three bottle coolers, and a pull-out aluminum and steel solid table, along with a germicidal waste trolley for clean freaks. When closed, the top half glows "sensuously" or something cheesy like that. It kind of cheats by throwing in a giant steel bookcase-type "wall unit" to hold everything that won't fit in the sphere itself, like four aluminum chairs, but since it also sports an oven and refrigerator, we'll let it go. No price, but it's more than you can afford. Gallery so you won't have to deal with the annoying entirely flash site after the jump. Think of it as my Easter present to you.